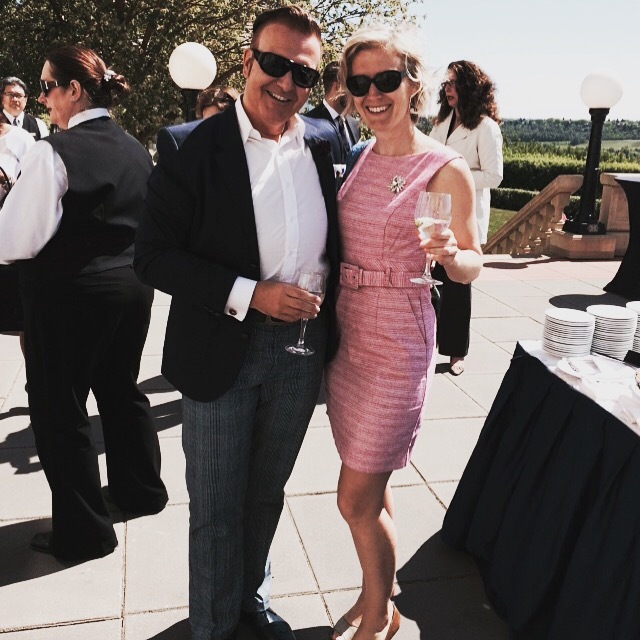 On Thursday I had the pleasure of spending my lunch hour on the patio at the beautiful Fairmont Hotel MacDonald for a media launch celebrating 100 years of the Fairmont Jasper Park Lodge. This year, the hotel is celebrating 100 years of luxury hospitality on the shores of Lac Beauvert. To honour this anniversary, the historic lodge has launched a series of centennial events and activities planned throughout the year, including outdoor summer concerts (featuring The Sheepdogs and Platinum Blonde), lakeside dining events, historic tours and traditional high-tea tastings. I also learned that the Fairmont Jasper Park Lodge has converted one of the restaurants into a new northern Italian restaurant ORSO Trattoria. Sous Chef Andrew Whiteside of the Fairmont JPL was on hand serving up a selection of their handmade pasta. While I couldn’t partake in the samples of fresh ravioli, he did walk me through the menu and assured me there were a lot of gluten free options. The help kick off the celebration – the hotel is asking social media users to share their favourite Fairmon JPL memories. 100 years ago, a night in the tents that were first erected on the banks of Lac Beauvert – creating tent city – cost 25 cents. For a lucky few – it will again. To enter The contest – just submit or share your favourite memory of the JPL using #JPL100 for a chance to win a night at the luxury hotel for just 25 cents per night. In honour of the contest – I am sharing some of my favourite memories. The Spaniard joined me for Christmas in November 2014 – it was the first time in his life he got to sit on Santa’s lap. The decorated trees, the life-size gingerbread house, the lobby at Fairmont JPL just oozes Christmas spirit. Oh… and so was meeting 80’s Brat Pack member Molly Ringwald during the PJ Party at the Fairmont JPL. In 2010 I attended my friend Kim and Wes’s wedding at the Fairmont JPL. What a beautiful place for a wedding ceremony. And the chance to have some bubbles on the grass with a beautiful mountain backdrop immediately after the wedding ceremony was amazing! You have until June 12th to enter, for more information or to enter click here.